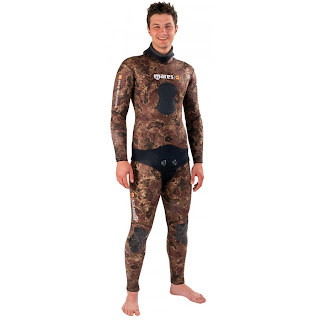 Wetsuits designed specifically for spearfishing are often two-piece (jacket and high waisted pants or 'long-john' style pants with shoulder straps) and are black or fully partially camouflage. Camouflage patterns include, blue for open ocean and green or brown for reef hunting. Commonly they have a pad on the chest to aid in loading spearguns. Sometimes they have reinforced elbows and/or knees. Often they have an "open-cell" interior, which offers superior warmth because of its very close suction fit to the skin (consequently lubrication is required to put on an open-cell wetsuit). Nylon exteriors are generally used to protect the spearfishing wetsuit from reefs. More delicate uncovered "smooth skin" wetsuits are sometimes used when diving from boats, because they dry quickly. For more wetsuit specific info you can visit our wetsuit guide.